Outside the Green Parrot. In 1992, I think. I was in a convenience store on Caroline Street, Sunday after the post-race party, a six pack of Fiji water and a laughably overpriced mini-bottle of Aleve in my hands, watching as the proprietor punched out tickets on the lottery machine and talked to the guy in front of me, a fortyish guy in cargo shorts, cap, and boat logo T-shirt. “How’d it go, last night?” the proprietor asked. I’ve been hearing a variation on this conversation in the Keys for twenty years. Cuba is the Holy Grail for anyone who runs a tourist boat business in Key West, and it’s a portent of doom for anyone who runs a bed-and-breakfast or a gift shop. There are very few people left on the island who remember what Key West was like when Havana was a legal destination for American tourists. I talked to one of them once, about ten years ago, on a casino boat in the waters off Key West. Florida law mandates that casino boats have to go a certain number of miles offshore—I think it’s three—before they can turn on their slot machines and start dealing cards. We were returning from one such trip when I went to the back of the boat to count what little money I had left. “I hope you didn’t put any money into one of those machines,” someone said. I saw that Captain Tony Tarracino was sitting on one of the two seats in the stern. I’d seen him earlier, playing multiple hands of blackjack at a modest five bucks a pop. I knew who he was from the times I’d seen him on a barstool in the Saloon he’d run from 1961 until he’d sold it in 1989. Captain Tony is as close to an iconic character as Key West has ever had. Much more so than Jimmy Buffett, who, though associated with Key West in popular culture, moved away from the island in the mid-1980s. I grinned at this gambler’s logic. Legend has it—and every statement made about Captain Tony Tarracino could and should be prefaced with the phrase Legend has it—that it was gambling that brought him to Key West. It’s said that Tony and a friend figured out a way to pick up New Jersey racetrack results on a shortwave radio just early enough to get bets in on those same races with Newark bookies. They won a lot of money in very little time, which earned Tony a trip to a Newark dump where goons beat him up and left him for dead. That was in 1946. Weeks later, he is said to have arrived in Key West on a milk truck with $12 in his pocket. Once there, he worked as a boathand, a captain of his own shrimper, a gun runner, and, in 1961, the owner and proprietor of Captain Tony’s Saloon on Greene Street. The bar is popularly advertised as the “Original Sloppy Joe’s Bar,” but it was standing empty in 1961 when Tony bought it. Immediately before that, it had been a gay bar that catered to sailors from the nearby naval base until the Navy placed it off-limits, thus ending its viability as a moneymaking enterprise. 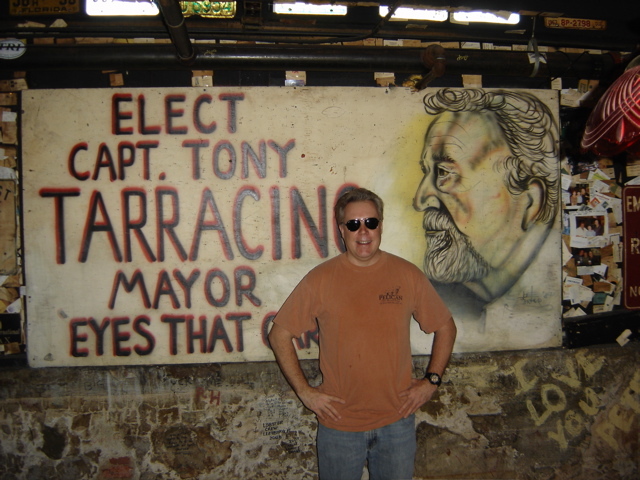 Tony owned and ran the bar from 1961 to 1989, when he sold it upon being elected mayor of Key West. “It’s the only game in town until they open all that again.” He gestured vaguely out over the waters around us. “All what?” I said. I didn’t know north from south. “Havana,” Tony said. “Cuba. They open all that again and Key West will go back to being a few shacks, an airstrip, and a shitload of mosquitoes.” He started in, then, on one of his oft-told stories, some misadventure off Cuba during the Bay of Pigs. I recognized the story as one he’d told many times from his usual station by the cash register in the saloon that still bears his name, a saloon he visited regularly for twenty years after he sold it, to sign T-shirts and pose for pictures with tourists. Tony Tarracino had arrived in Key West just after the worst of the Great Depression years, but he would have known many people who’d lived through the island’s lean years when virtually every year-round resident was on some sort of government relief. The history of Key West has been revised and reinvented many times, and the 1930s are now summed up primarily by tales of Ernest Hemingway and big fish stories. The truth is that the island was desperately impoverished in the 1930s and the few viable businesses on the island included a couple of bars with illegal gambling in the back, the Pan Am mail and passenger service to Havana, and a few notorious brothels at the southern end of the island. As Tony was telling his Cuba story, two girls in their early twenties appeared in the back of the boat. Tony had been talking to them earlier at the card table. One of them had gotten a pen from one of the boathands. They had decided they wanted autographs. Tony took the pen and one of the girls turned around and lifted the sweatshirt she was wearing to ward off the chill. Underneath, she was wearing a tiny bikini bottom. Tony signed one bikini bottom, then the other. We watched the girls scamper back up the ladder to the bar above us. “I’ve signed a lot of asses in my day,” Tony said. Tony talked for a little while longer. He graciously shared a couple of card-playing tips with me, both of which eventually lost me considerable money until I abandoned them. When we pulled up to the boat slip, he was the first one off the boat, helped by two mates. He would have been about eighty years old then; he’d fathered his last child, with his fourth wife, a woman half his age, at the age of seventy. In Captain Tony’s. February, 2010. The bar he owned and/or presided over for almost fifty years has always prided itself on being a bit of Old Key West, even as new Key West grows ever more upscale around it. This, of course, was never really true, at least in the years that I knew it. Captain Tony’s Saloon is one of the triumvirate of bars—the Hog’s Breath and Sloppy Joe’s being the others—that every cruise-ship daytripper makes a point of hitting on their three-hour sojourn on the island. At night, the bar is taken over by young people, kids who seemed young to me even twenty years ago, who favor the sweet rum punch doled out in souvenir Captain Tony’s plastic cups and get their bras and bikini tops stapled to the rafters. I can’t remember anything of consequence ever happening to me there, though I did see the deciding game of the 1995 Mariners-Yankees playoffs there, the thriller that represented Don Mattingly’s first and only sniff of post-season play in his between-the-glory-eras career. Captain Tony passed away a little over a year ago, in November of 2008, at the age of 91. He was the island’s last link to an age before Disney cruise ships and Fantasy Fest parade floats sponsored by Captain Morgan rum and MetLife insurance. He’ll be sorely missed. I saw on the ride down that the Caribbean Club bar at Mile Marker 104 in Key Largo now has a massive, imposing neighbor in the form of Jimmy Johnson’s Big Chill. Johnson, of Miami Hurricane and Dallas Cowboy championship fame, is probably the Keys’ biggest resident celebrity these days, and his new venture will surely steal whatever tourist traffic the Caribbean Club was getting. I stopped in at 11:30 on Saturday morning, en route to Key West in a rented Nissan Xterra, and found the usual crowd of locals already holding down every stool around the bar. I used the restroom, bought a can of Miller Lite for a dollar and took it out back to where other locals were struggling with boats on the boat ramp. The Caribbean Club’s small claim to fame is that its location was used to film exterior shots for the Humphrey Bogart film Key Largo. They might be selling less of those Bogey T-shirts in the near future. And the race. The Key West Half Marathon. It was a beautiful course around the perimeters of Key West and Stock Island. I realized a half hour before race time that I’d left my iPod headphones in my car back in New Jersey, so I ran the race without musical accompaniment. It was an interesting experience, something I may try again. On purpose next time. Final tally: 13.1 miles, 1:59:23. 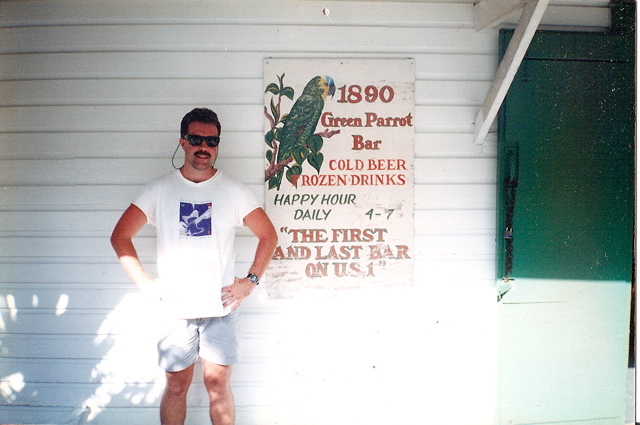 I did manage to close down the Green Parrot one night, Monday night, though I was only able to do so by napping from 9pm to 1am, then getting out of bed and arriving at the Parrot at 2am. The Parrot has not one but two 24-hour webcams in place now—something its management once insisted it would never have—and an upscale little boutique next door that sells the T-shirts that used to be jammed into a plastic bin beneath the bar, as well as all manner of kitschy coffee cups, frameable prints, and refrigerator magnets. It’s still open ’til four, and they’ll still put your last beer in a plastic cup for the road. That was my only late night “adventure;” I sleep a lot more now when I’m away. I find more and more that the willies have a way of seeking me out if I become stranded between here and there. I’m much more susceptible to unease when I travel alone—I feel more alone—than I ever did in my twenties and thirties. The dreads come stalking me even as the bartender in some airport or casino or restaurant bar sets a first glass of beer before me. Sometimes that unease can spiral out of control, and I’ll find myself trapped in a place I don’t want to be, watching the Weather Channel repeat itself in endless loops, and making phone calls I shouldn’t be making. These days, I find it’s best to have always in front of me some destination or goal. I don’t have to be there yet, engaged in that activity yet, but I like to know it’s there, orienting me, drawing in the slack of the unpurposed time before me. On my way out, on Tuesday, it was 75 degrees and sunny in Key West. I like to drive into Key West, but I take the puddle jumper out. When I arrived at the airport, I saw that it has been completely remodeled and expanded. The old Conch Flyer, the airport bar that once opened onto the tarmac, is now on the other side of the airport access road, attached to a new parking deck and connected to the departure gates via a long elevated walkway. For a long time in Key West, the Conch Flyer was the bar of last resort. When every other bar was closed at 4am, the Conch Flyer, due to some odd Keys law governing airports, was allowed to stay open 24 hours. As a result, the Conch Flyer became a haven for off-shift strippers and bartenders, late-night oddballs, and purveyors of the kind of controlled substances of interest to people who are still drinking at 6am. Tourists flying out of or arriving in Key West would sometimes find themselves in the midst of last night’s party, still continuing unabated at the Conch Flyer at 8am. The new Conch Flyer is an anonymous airport bar with some Pan Am gear on the walls. As I finished a beer and prepared to meet my plane, the barmaid was wiping down the bar and preparing to close out the register. I was the only patron at the bar. “Going off shift?” I said. She smiled at me like someone hearing the same comment for the thousandth time. “Yes, PM,” she said. Overhead all the TV monitors were tuned to the Weather Channel, which showed an ice storm looming over South Carolina and temperatures in the low 20s back home in New Jersey. I shouldered my bag and headed for the new, improved transportation security area. This entry was posted in Incriminating Evidence and tagged Captain Tony’s Saloon, Conch Flyer, Cuba, Green Parrot, Havana, Hog’s breath, Jimmy Buffett, Key West, Key West Half Marathon, Pan Am, Sloppy Joe’s, Tony Tarracino by Harry Ramble. Bookmark the permalink. You need to get published. Now. Hi, Nancy! Thank you for the kind words. (Unless, you know, your comment is intended as more of an order or command, in which case it should be noted that I have a long-documented tendency toward insubordination.) At any rate, sadly, my media platform is really more of a narrow ledge at this point in time. I saw the first cover of your new series of Sense and Sensibility graphic novels. Great stuff! I’m sitting and knitting in an armchair in Maine today, as I stumbled upon your blog. Thank you for transporting me to a place and time I could only dream of, since it no longer existed by the time I began traveling around the country. I enjoy your writing.